IPVanish Review And Discount - Really A Good Choice? IPVanish offers some of the best speeds in the market, maxing out most Internet connections, with speeds of over 60 Mbps or 7,5 Megabyte per second in our tests, so if you want really high speeds, you might want to take a look at them. Also, due to a number of beginner-friendly apps and software for most platforms available (PC, Mac, iPhone / iPad and Android phones), setup and usage is a breeze. On the more technical side, IPVanish offers dynamic IPs, which is very interesting if you like to download files from file hosters such as MEGA or Uploaded.net in free mode. Also, there is a no-logging policy in place, meaning they assure you of logging neither what you do online nor who used which anonymous identity at which time, very handy if you’re a bit on the paranoid side. With hundreds of servers in over 60 countries, you’re have a very high chance to get high speeds even in more exotic locations, and can bypass a lot of geo-restrictions. Pricing is reasonable, starting at $6.5 per month, and strong encryption protects you from spies with all important protocols supported, so IPVanish is very competitive. Apart from the missing Internet kill switch (a bit of a handicap for file sharers), we can safely recommend them for most people out there. All in all, IPVanish is one of our favorite services, and gets our award for best VPN speed. Congratulations! When the people behind popular Usenet service Newshosting and various resellers, Highwinds Network Group LLC, announced they planned on going into the VPN market in early 2012, we were rather uncertain about what to make of it. At that time, dozens of VPN providers saw the light of day, mostly copying each other with the name and logo being the only way to decide which was which. Another one, really? Especially the more popular and higher priced ones were always known to offer quite a few servers in different locations all around the world, but also to not be very filesharing-friendly, encouraging torrent user to take their business elsewhere, and most importantly, to keep connection logs, not a very popular policy in the eyes of many. IPVanish, however, does almost everything right, as we will see in this review. For starters, they’ve switched to a complete no-logging policy, offer the best speeds we’ve seen in a long while, and is happy to allow torrents on their network. Most information you need to know can be found on their website, but you’d have to search a bit to know about their no-logging policy, or that torrents are allowed. This is a bit of a pity, because these are vital arguments for this service we’re going to futher explore in this review. Instead, the website is more focused on regular users, citing things such as basic benefits of VPN usage and so on, their support section and members area. A bit hidden on the top part of the site is a forum, which we will discuss later. Signing up is straightforward, and requires only an email address and, of course, a payment method. Here IPVanish really shines, as they allow anonymous payments by Bitcoin or even PaySafeCard on top of the usual options such as Paypal and credit card, and also bank transfer, particularly interesting for European customers. A little issue we saw: Their website lists Hulu as compatible, but unfortunately they have decided to block all VPN users in order to avoid circumvention of their geo-blockades, and IPVanish seems to be no exception; this information is a bit outdated. Regularly though, you pay $10, $8.99 or $6.49 per month respectively, which can be considered in the middle price class, and many others offer crummy service at higher prices. Plans are very reasonable if you ask us, and nobody can say this is too much for them to spare for a quality VPN. Obviously, you can’t do just anything with any VPN service, or more precisely: Not every VPN has the features and policies you need to do certain things. For example, some providers have not the right location available to bypass geo-restrictions for a country you need it for, your mobile device isn’t supported because you have to rely on a special protocol (this is mostly the case for older devices), or torrents or file sharing in general is forbidden and blocked. We don’t think this is the case for IPVanish: It combines all important features, supports all protocols you might need, and you can basically do anything with it, with small exceptions. – In terms of server locations, the website claims that “14,000+ IPs on 140+ servers in 60+ countries” are offered (see a detailed list here), with a majority of those servers located in the US and Europe. This should cover almost anyone, even if you live in a more exotic location or need no bypass anything lesser-known. This means low latency times and higher speeds than some other services will provide to you, because you’ll find it a lot easier to find a fitting server for your needs, especially when you live in a smaller country where other services don’t have dedicated servers, for example in Thailand or Australia, so if this is your current location you might want to definitely consider IPVanish if you need a bit more than your usual one-size-fits-all VPN service. Particularly, if you’re behind a connection faster then, let’s say, 30 mbps, this could really help you to max out your connection. – Like every other VPN we know of, IPVanish doesn’t censor or block any website or service, so you can use it to bypass censorship in your site or network, particularly interesting if you live in a country with relatively modest Internet censorship that isn’t particularly sofisticated, or if your network administrator blocks certain things like Skype or Facebook, for example at your university. If you live in China or Iran however, IPVanish might not have the appropriate tricks to ensure a stable connection, such as “Stealth VPN” and similar some guys have developed to deal with attempts to filter and block VPN access in general. – IPVanish is BitTorrent-friendly, so you can download as many torrents as you like with no problems whatsoever. Like the founding fathers of the US, “we hold this to be self-evident”, but not everybody out there agrees, specially not all VPN providers, and so it is important to reassure all our fellow file sharers that this is not an issue with IPVanish. – Mobile devices can be used, even older ones, since the oldfashioned PPTP protocol is available, allowing almost any device with even mediocre VPN support to connect. For iPhone and Android there are even free apps available, designed to automatically setup everything for you, and you can get these apps for free in the app stores / markets of said platforms. This mainly comes down to what protocols are supported. The protocols themselves can have slightly different, varying encryption strenghts and so on, but everything except the PPTP protocol can be considered very secure, as it is almost impossible for anybody to crack through them, even for government agencies except, maybe, the NSA, and are regularly used to securely transfer data. As expected, IPVanish supports all major protocols, including IPSec / L2TP, OpenVPN, and also the notoriously unsecure PPTP if you really have to rely on it. For anybody looking to stop their ISP or network administrator from spying on their traffic, using public WiFi securely without fear of hackers getting to their passwords or snooping in their data, this is vastly enough, and comes very near total data protection, at least for the way your data takes from your PC to the Internet and vice versa. The only thing we missed were special stealth encryption features to circumvent strong VPN blocking systems such as used by particularly restrictive states such as Iran or China, a feature a few providers have enabled, but these are very specialized encryption and traffic hiding scheme the vast majority of users don’t need. So on the encryption side of things, we give IPVanish 4.5 out of 5 stars. Two things matter here, the first one being the question of logging. When signing up to the service, you only have to provide an email address, and you have the option to choose a relatively anonymous method of payment such as Bitcoin, so IPVanish doesn’t really have much to give out anyway. More important, however, is the notion that „over 14.000 IPs“ are available, suggesting every user is assigned an unique IP for the period he is connected, or at least users normally don’t share the same IP at the same time, something other providers like to do because it not only mixes peoples traffic together, making it even more difficult to trace back who did what on while connected to the VPN, but also because it is way cheaper (IPs cost money after all). This is a very good thing actually for anybody who likes to use file lockers to download files, because you’ll always be able to download and not be subjected to a „sorry, your IP is already downloading another file“ notice when someone else on the server had the same idea as you, but it makes it absolutely vital to have no logging whatsoever, be it activity or connection logs. Fortunately, this is the case for IPVanish. 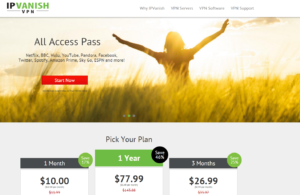 Somewhere in 2013 or 2014, they switched to a no-log policy, as they told TorrentFreak in the latest installment of their „Which VPN Services Take Your Anonymity Seriously?“ series, meaning it shouldn’t be possible for IPVanish to match an external IP address with a users account, protecting your privacy. So, we classify IPVanish as a „non-logging“ provider, which suggests high anonymity. Again, 4,5 out 5 points from us. 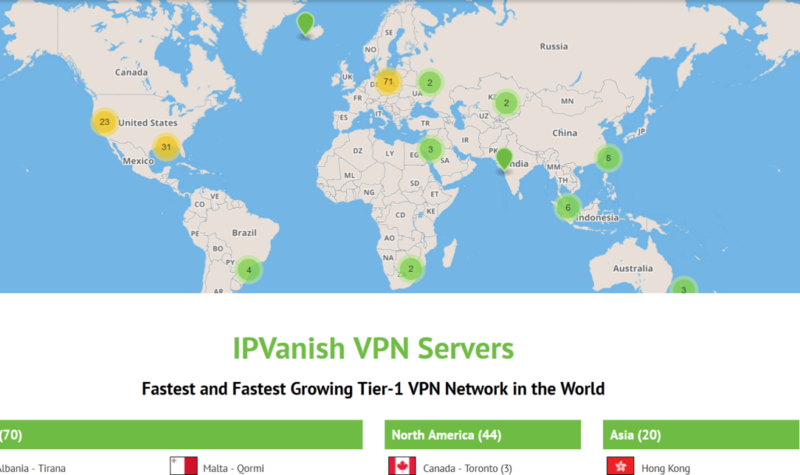 On their website, IPVanish boasts about being the “only tier 1 VPN provider”, meaning they got direct access to main Internet broadband connections, as opposed to being only indirectly connected to the net, resulting in the connection passing through several middleman and therefore creating bottlenecks. In theory, that should mean top speeds, in fact the very best available out there, at least this is what is suggested. 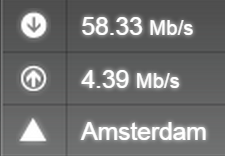 In accordance to our speed testing philosophy, we put three servers to the test, both with a regular speed testing site and also a Usenet client to see what the connection is really capable of, and posted the results down here (IPSec proved to be the fastest protocol for us). As you can see, these are absolutely great results, actually the best we ever got, right in line with Newshosting VPN which seemingly uses the same connections, as it’s from the same company. With this, they go right to the top of our ranking in terms of speed and earn the award “fastest VPN service”. Congratulations! With such speeds, most users won’t notice any difference in their connection speeds, and it is perfectly suited to stream movies without lags, download huge files or use torrents. Like many other providers, IPVanish relies on their own software, both on desktop (Windows, Mac) and mobile operating systems (Android or iOS for Apple products), and thus offers a few more options than the usual, onboard setup on your system, such as automatic selection of the best servers, automated connecting etc. As you can see, it always sorts through the server list and preselects the closest one. Above it, the secure OpenVPN protocol is preselected, although you may try to use IPSec for maximum speed. To connect to it, simply hit the “Connect” button to the right, and off you go: The map will show your new, virtual location after a few moments. The “Server Selection” tab is also rather interesting, as it allows you to quickly select the right server for things like watching video on geo-restricted US websites with just one click, definitely handy for some people. Under “Settings”, you can futher configure the program to auto-connect on startup and stuff like that, as well as select more advanced options such as different ports and the preselected protocol if you need this. Generally, we can say that the client is fast, stable, thought-through and, most of all, really user-friendly, and can be recommended. So, is everything fine and dandy? Not quite. We are really missing a very important feature for everyone who wants to let his computer share files or do sensitive things on its own, without any worry of IP leaks: An “Internet kill switch” or at least, an “application killer” feature, which keeps you safe and protected in the case of an unintended connection drop. What happens without it, is that as soon as the VPN disconnects and maybe, takes some time to reconnect, your favourite file sharing tool starts sending traffic completely unprotected through your connection, without any anonymization. There are third-party tools that do this for you, but we really prefer to have it all in the form of an easy, one-click feature integrated in the client. We believe it should be 1st place on their priority list, because it would make the service almost perfect. All in all, we prefer email support however: It just makes it really easy to get “to the source”, and get immediately redirected to the correct department instead of messing around with the other options, but this is kind of a subjective thing we suppose. IPVanish managed to get directly to our hearts *insert romantic music* They do almost everything right, with a stable client, a huge selection of servers and locations, moderate prices and the very best speeds we ever saw on a VPN, which gets them our award for “Best Speed”. If you’re looking for a reliable VPN, you can safely choose these guys, especially since they have a no-logs policy in place. This makes them one of the very few providers to provide dynamic IPs out of a very large pool, important if you like file locker services like MEGA, Uploaded.net and whatnot, and still don’t keep any logs. So, privacy is great, speed is awesome, and you can use it for anything you want, from anonymous file sharing to just plainly evading censorship. Definitely one of our favorite providers, a safe choice in any case. PS: A reader recently wrote us he did a search for a site we recommended, and landed on the wrong page. Honestly, we have no idea how this might have happened, but here is a live preview of the correct IPVanish website. Better yet, just click on the link at the top of the page, and you’ll be redirected to the right place, period. i am using IPvanish vpn for mac os and i am facing continuous dis connectivity issue.